YAY! I am sure I don't speak just for myself when I say that I am just thrilled to know that there is more someday! I never deleted VV from my RSS for just this reason :) Thank you so much for sharing your inspirational and motivational life with us! I really enjoyed the bits you've posted so far and was pleased to see your post just now. I'm looking forward to the rest of the 'story'! I know how hard it is to take up a memoir after an hiatus. There are quite a few stories I've abandoned due to loss of memory cohesion. I hope you can come back to this one. The least I can do is add to the assurances that you still have an audience. Something nudged me to check Vespa Vagabond tonight just before turning my computer off ... this was totally out of the blue after being away so many months. Now I can go to bed happy. Thanks all you for the happy thoughts! Thanks for the update, Shreve. Looking forward to your return; until then, I'll continue to enjoy The Daily Coyote! Cool. Can't wait til you get back, but I do understand the desire to live a bit in the present, too. Charley needs you, and Chloe, and Daisy. For Eli, you're staff. I still check every few days, just in case, and today i was suprised to see a new post! So, as everyone as proven, we're still here, when you're ready!! I'm just starting to read the archives and was really excited to see a new post on my RSS feed. Anyway, I can be patient, especially since there are all these archives for me to read. :) I'm glad to hear you plan to keep writing someday. Just bumped into your book the other day. Thought I'd check out your adventures on the website. I am envious of your journey and wish I had the patience to write down mine. For now I will enjoy your writings. Thanks for sharing. Just found your blogs and I love them. I am reading your book The Daily Coyote and am thoroughly enjoying it. 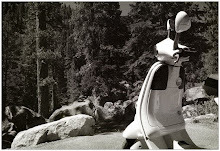 Perhaps some day you will be inspired to write one titled "Vespa Vagabond". I look forward to reading all your posts old and new. Thanks sp very much for sharing. We're still here. Glad you are too. You've been an inspiration to many, to take the leap and drive across the country on a Vespa. hello! i stumbled upon your blog and i had a heartattack! we are a community of travelers/artists at vagabondbond dot com and love the content of your blog. amazing!!! wyoming! how gorgeous! i'd love to keep in touch with you in case we start featuring vagabonds on the vagabond site (how random that our logo is a VESPA!!!???). blessings to you! A friend forwarded to me this blog. Right at the time that i sold my LXV150. What a way to stick it to me. I regret, more than ever before, selling my favorite mode of transportation. I started from the beginning of your blog and just finished a moment ago. I will have another Vespa in the future. Yes, i will. I am so glad you are back... or plan to be, anyway. A friend sent me your book "The Daily Coyote", with just a note: read it. Who knows... in the meantime I'll be looking for more of your posts. Well, I'm still watching! Or actually my RSS reader is doing that for me :) I'd love to see and read more about your trip! Your photos sort of remind me of (a better, more impressive version of) my California roadtrip, which was obviously way shorter and less courageous than yours. Reading Vespa Vagabond makes me want to do that again, but better. 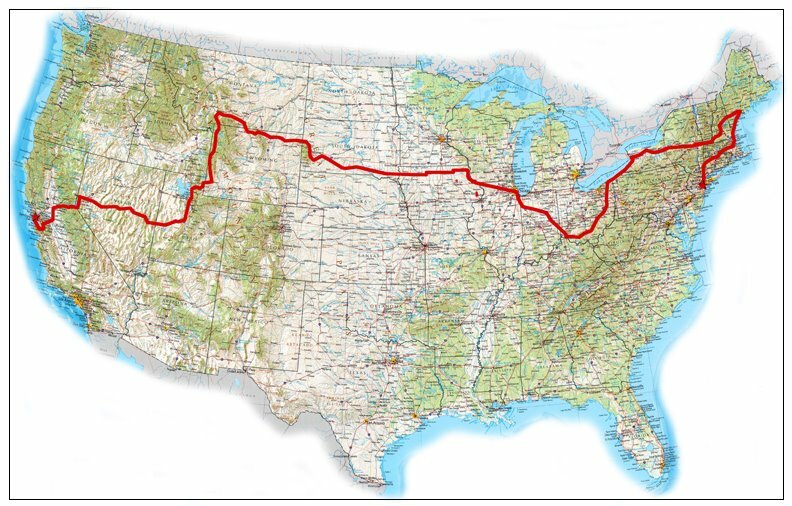 I found your blog while researching my plan to cross the US on a Vespa in order to take pictures, meet people and record their stories. Turns out I am not alone. Hope you are doing well. Yes, we're still here and interested. Tell your publisher. Many congratulations on your Daily Coyote book; I am an editor who "discovered" your blog too late to see if my company could publish your book. If you are looking for a publisher for your Vespa book, I would love to take a look. We have had a lot of success helping to launch the careers of several bloggers turned authors. We have had many NY Times bestsellers as well as books that have helped millions of people as well as the planet. You can check out our web site if you like: www.hcibooks.com. Best of luck with your writing. I would like to do a write up on my blog about your adventure across country. You're an interesting human being: Intelligence, beauty, wit, insight, courage. Has Mike ever wondered aloud at his great good fortune? I just learned about your blog, and already I can't wait to read more about your experiences across the country! In such a short time (i.e., a day), you've inspired me to take advantage of out-of-the-ordinary opportunities that arise. I just recently finished grad school and moved on to a "big-girl" job (that luckily includes travel). Reading your posts have only cemented in me my desire to not get stuck in the rut of the working stiff. Though the story is unfinished, what you did is really inspiring to me. I enjoyed reading through your blog this afternoon. Good luck to you in your future adventures. Keep going with the blog, I really enjoy reading your stories! Wow, and the vespa didn't break down going through all the cornfields throughout central US?? I have a blog (http://scootcommute.blogspot.com) and I have linked to your blog. If you feel that the link is inappropriate, I'll edit as you suggest. Your blog is wonderful. I absolutely relate to your having to immerse yourself in what you're writing about. It's almost as if, after you do that, words just flow onto the keys and into the eyes of others to be inspired. Keep up the good work. I look forward to hearing more. And since you're in Wyoming, sometime you should cruise your Vespa down to Salida, Colorado to enjoy some art and rafting. Almost two years ago since your "Ciao for now", perhaps it's a good moment for support you to remember this project. Or perhaps it isn't, I don't know. I just finished reading your "daily coyote" book & thoroughly enjoyed it and am sad that I don't look forward to going to bed as much without the book to read. I kept saying to my husband "wow, this girl is so similar to the way I think.....you even named your dog chloe, which is what I named our last dog. That was me getting on the Asuran with the bad hair sleeping on the floor. I usually get after people for using skill/spells and I'll also dance occassionally on the bar. IC Boann is a bit outspoken and a little crude from spending most of her time with mercenaries of the male persuasion. If you're irrtating her, she'll tell you and she can be brutally honest about the food that may (or may not be) available that night.